The Concord T-Shirt is designed with a deep wide neckline, but if that’s not your style – or you have narrow shoulders – no worries, there are some simple adjustments you can make! Today I’m going to take you through two adjustments that will get you the fit you’re after. 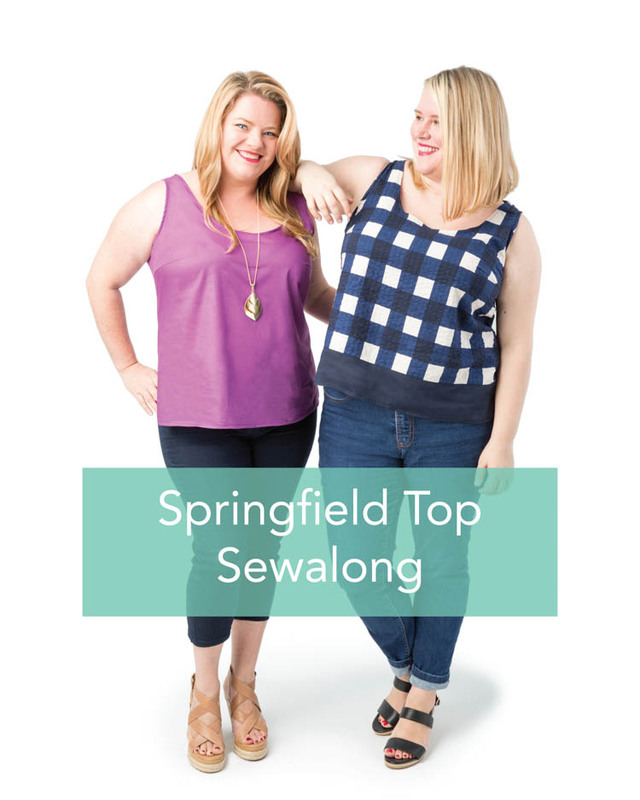 These techniques will work on most other simple tops or dresses, too. 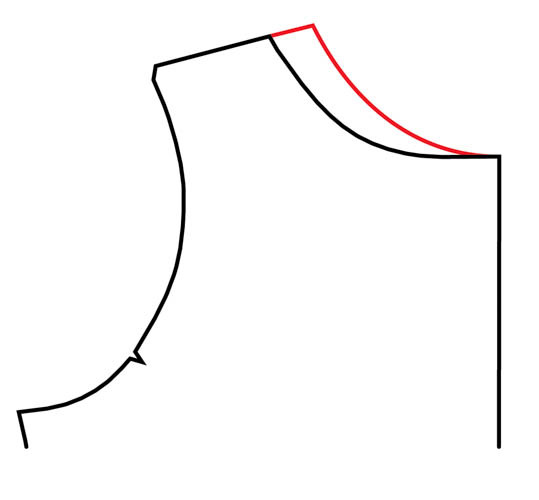 The key thing is to make sure that the neckline is correct at the center front: for the scoop and high necks, the line needs to be perpendicular to the center front as it hits the center front so that it ends up in a curve; for the V-neck, it’s the opposite: make sure it ends at an angle to get a sharp V.
If you extend the shoulders as shown in the example above, make sure you make that adjustment on the back piece too. Now, you need to alter the neckband. 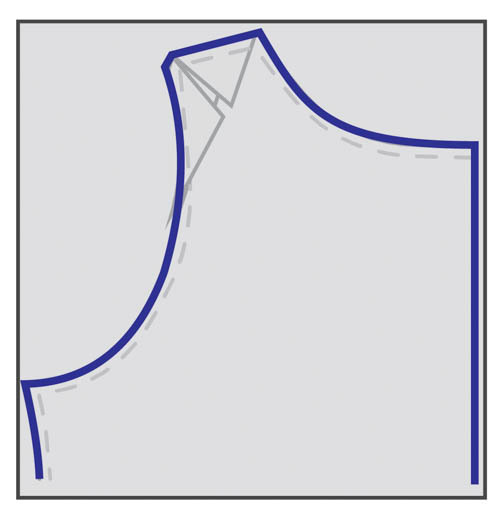 To do that, draw in the seam allowance of your pattern pieces around the neckline (the front and back). Then, measure them. To determine the length of your neckband, multiply that number by 0.8 (depending on your preference and jersey stretch you can go from anything to 0.75 to 0.85, but 0.8 usually works for me). Adjust the pattern piece to that length (it will now be shorter). If the shoulders of the Concord T-shirt are too wide for you (the sleeve is starting down your arm rather than at the corner of your shoulder), then you can also narrow the shoulders. Make a muslin, and pinch out the extra fabric in the shoulders you want to remove. Measure that length. 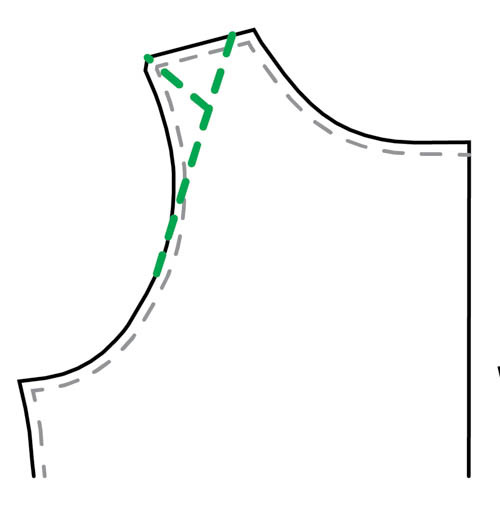 Draw in the seam allowance on your front pattern piece. 2. 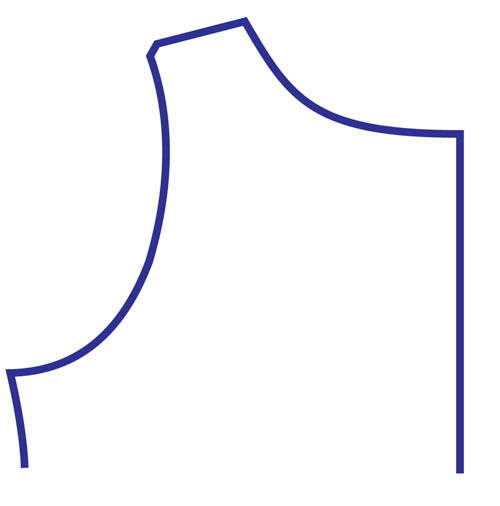 Draw a line from the armhole to the shoulder, and then a second one going from the top corner of the shoulder to the first line. Don’t worry about them being precise – as long as they look like this picture, it’s fine. 3. 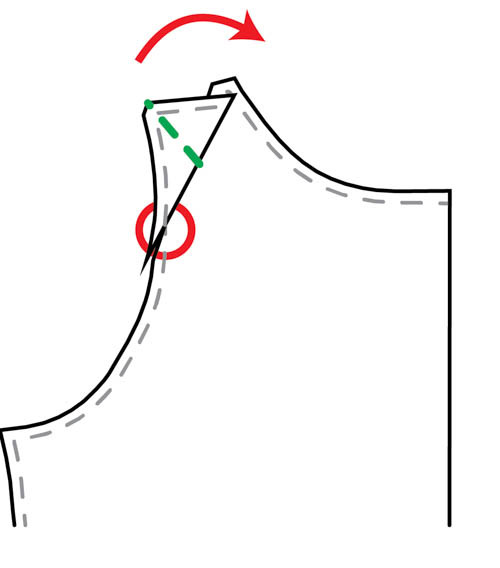 Cut the first line carefully, starting at the shoulder and ending at the seam allowance. Then, make a tiny snip on the other side of the seam allowance, leaving a little hinge of paper. Carefully pivot the piece to the right, overlapping the paper at the shoulder by the amount you need to remove. 4. 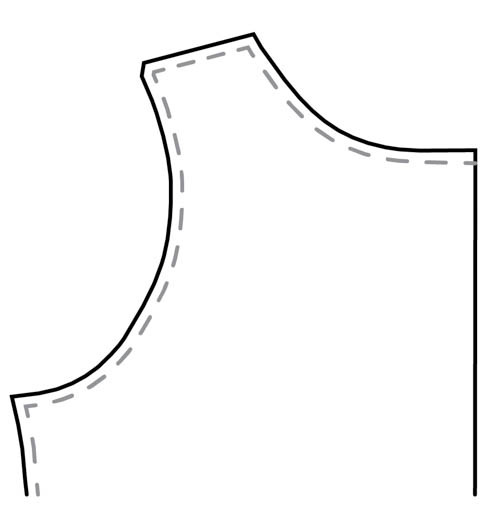 Cut the second line, starting at the inside of the piece and ending at the seam allowance. Again, snip the line within the seam allowance and leave a hinge of paper. 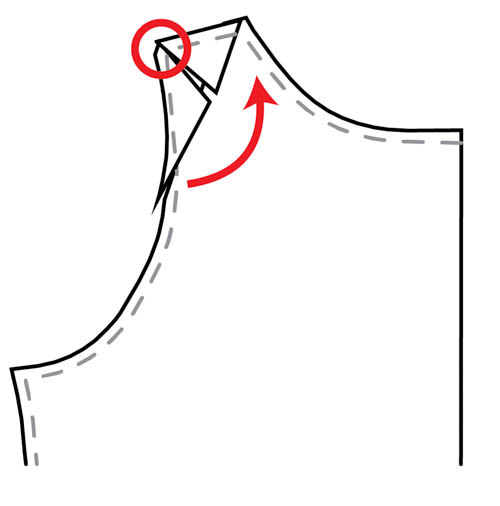 Swing the small triangle up to make the shoulder seam straight again. 5. Place a new piece of tracing paper on top of the pattern, and trace the new piece. And that’s it! Simply repeat with the back piece. The armhole is the same length as before, and in a knit, you won’t have to alter the sleeve (in a woven, more adjustments might be needed). Let me know if you have any questions about these techniques! 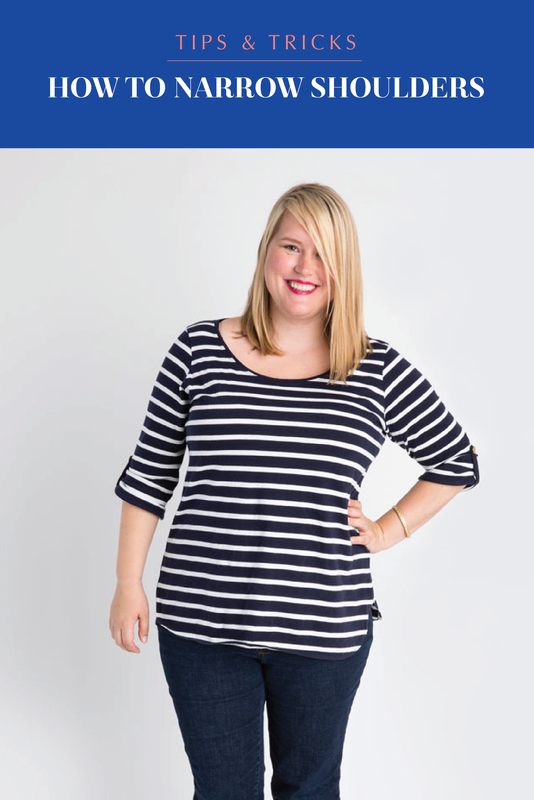 Want to learn more about fitting for a curvy figure? Check out our online workshops and our tutorials! So clear and you make it look so simple. Question: is the 0.8 also applyable if I work in centimetres instead of inches? Yes, as it’s a ratio. Hey Jenny, thanks for this tutorial. 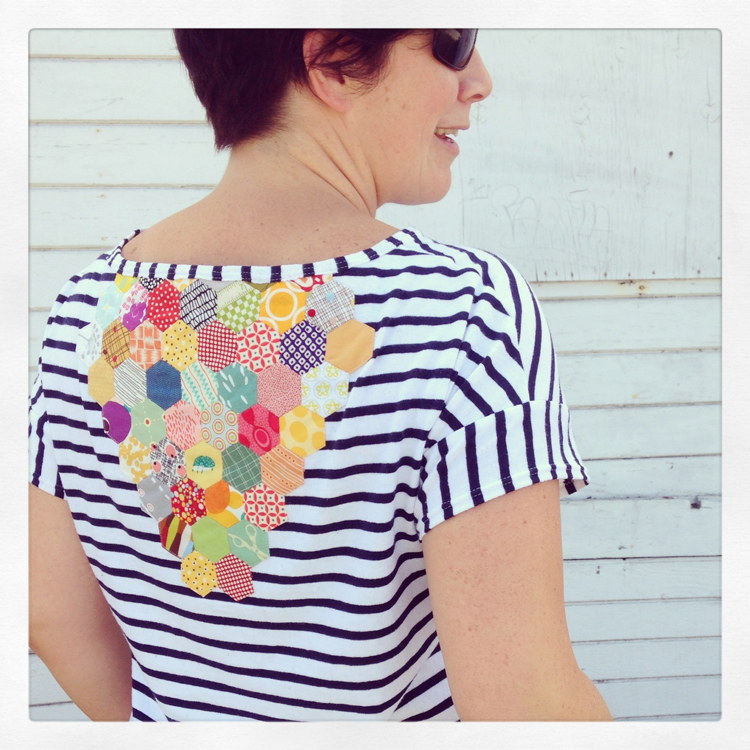 I recently did a narrow shoulder ajustment on my dress version of the Concord Tee. I did this by pivoting the pattern pieces (based on Zieman) but I think I ended up with a similar result as the one you described. However, this has left me with quite a lot of excess fabric at the arm scye around the high bust. The bust itself fits fine. I was wondering if you have any tips on what to do about that? I sewed the smallest size (12) with C/D bust. Thanks a lot for a lovely pattern! I bought a lovely dress which fits everywhere except the neck. It is too wide and so the shoulders come over the arm which has sleeves. I’m afraid I’m not really an expert on altering already made clothes. The only thing I’d know to do is unpick the whole thing, re-cut the pieces and re-sew but that might be more work than you want to do. Made up a size 14, but the neckline in the back hits too high and gaps… everything else fits… I ran into the back neckline height problem in the springfield as well so I was kind of expecting it here when I mocked up the muslin. So I pinched out 3/4″ of the neckline, transferred to pattern. 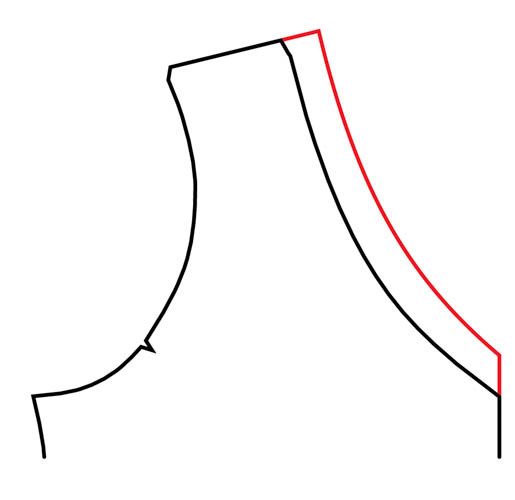 For reference I went ahead compared my modified Springfield back pattern piece to the concord back, because I like where that neckline hits, and found that the concord neckline was still high. With all this adjustment how do I figure out the neckline facing. Would it be the same? Just a little more stretching of the facing? I’m not sure what pattern you’re referring to, and none of them have a facing. Can you clarify? Would what be the same? Just made my first Concord Tee shirt and guess what-the neck was too large and the shoulder needed to be narrowed. How surprised I was to find this article. I’m a happy girl! I have lots of fabric waiting for the Concord pattern. I made long sleeve and tunic length. I plan to experiment with hacking to make a Concord Cardigan and mini dress. Thanks for this tutorial. Now i just have to get my Singer and serger to sew knit fabric better! Thank you for bringing this to our attention on the Cashmerette FB page. This is exactly what I need (which I realized after making my first Concord (12 C/D). Glad to have found this out before I attempted my Turner or Upton patterns!